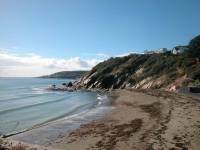 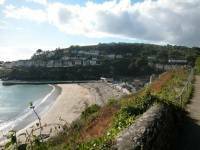 Looe is the last major settlement on the coast path before Plymouth. 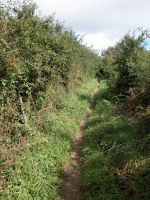 There are twenty one miles still to walk and really fit walkers might contemplate closing the gap in one day, but for most this would be a very considerable undertaking. 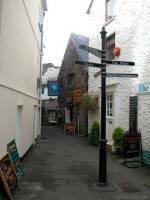 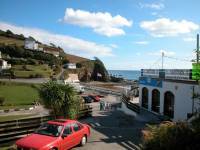 There are several small villages between Looe and Plymouth and all of them are on public transport routes so it's really a matter of choice where you make your overnight break. 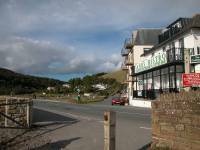 I plumped for Portwrinkle, which is visited only by a couple of buses per day though Crafthole, not much over ten minutes' walk inland, has a far more regular service. 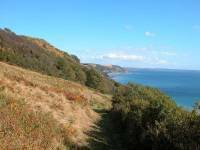 It's barely more than seven and a half miles from Looe to Portwrinkle but it does contrive to feel much longer, for yet again there is a good deal of up and down work to tackle and the continual reascents are tiring. 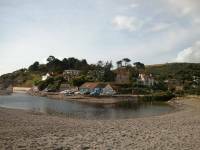 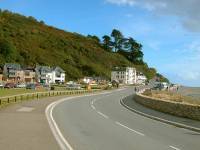 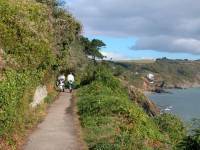 There is rather more variety to the route than there was yesterday between Polperro and Looe; a good proportion of the route lies in or near built up areas such as Seaton, Downderry, Millendreath and Looe's extensive eastern limb. 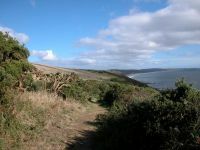 The rural parts provide a mix of woodland, scrubby slope and open pasture though there is no real cliff or rock scenery. 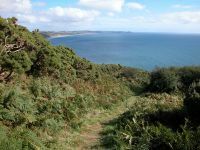 Parts of the route reach a surprisingly high elevation, particularly Battern Heights beyond Downderry (at 462 ft the highest point of the South Cornwall Coast path). 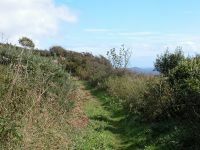 A dramatic moment occurs on these heights when, quite suddenly, the first view of Plymouth opens up before you with the dark heights of Dartmoor beyond. 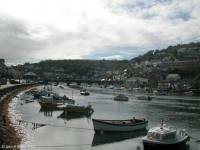 We begin today's journey at Looe Bridge, which links West Looe to East Looe across the Looe river. 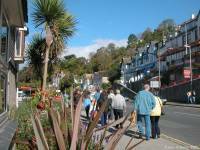 You may already have taken a good look around Looe at the end of yesterday's walk, in which case you will already be aware that East Looe is the town centre. 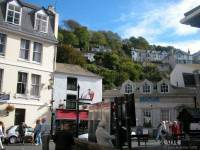 I've already said a few words about Looe on the previous page and I won't repeat too much here. 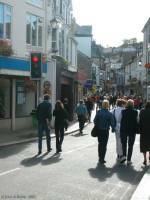 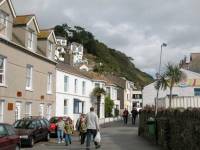 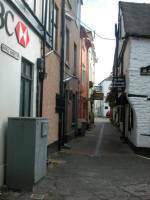 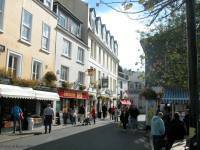 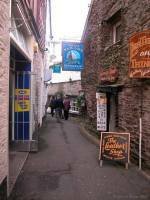 East Looe is cramped, and crowded into narrow lanes just like Polperro. 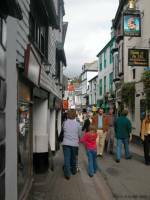 It targets the tourist unashamedly and has gone decidedly downmarket - so many of its shops sell tourist tat, and in its many cafes you will be hard pushed to find anything on the menu that doesn't include chips. 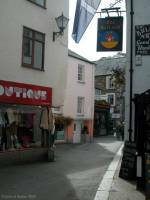 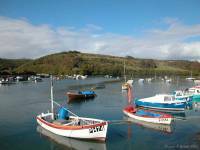 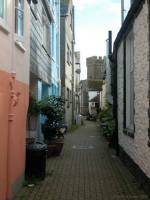 There is charm in East Looe, though, plus several hidden delights, if you choose to seek them out. 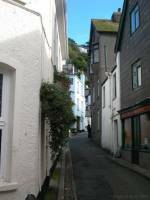 Just as in Polperro it can be rewarding to wander at random and poke your nose into shop doorways. 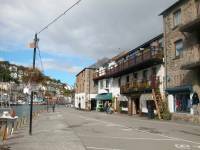 At one point you will discover a block of four impossibly narrow lanes in a grid layout, and inevitably you will find yourself at the harbourside moments later. 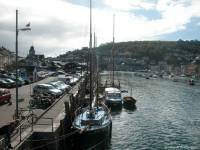 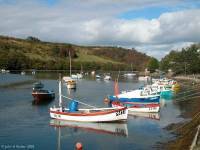 The harbour is a busy place, and unsurprisingly is a departure point for a variety of boat trips. 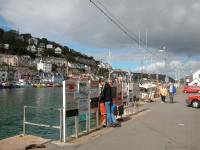 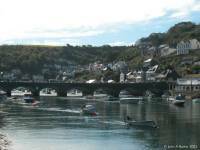 It seems that Looe is the centre of Britain's shark fishing activities, such as they are, and the boat trips include a number of sightseeing and wildlife-spotting opportunities. 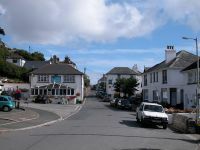 Just around to the left from the harbour is the beach. 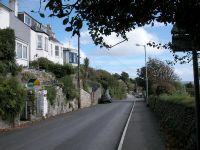 It's not really a pretty sight, just a meagre stretch of sand hemmed in by a complex of concrete sea walls, but the view to the east is quite inviting. 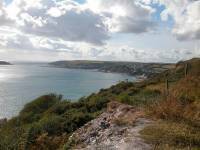 Rame Head, only six miles short of Plymouth, looks quite close now. 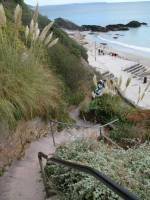 The Coast Path leaves the beach by a series of flights of concrete steps, climbing the slopes in zig-zag fashion. 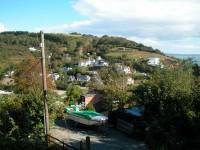 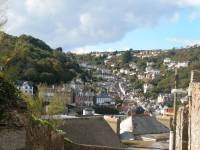 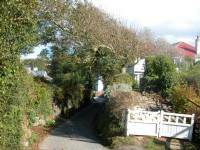 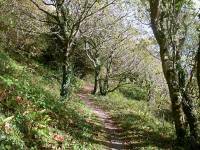 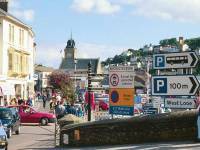 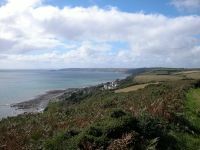 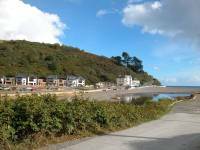 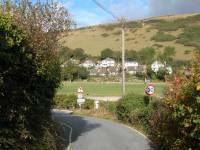 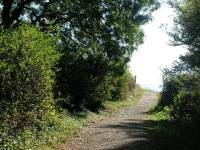 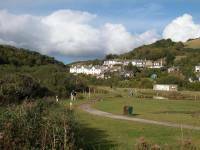 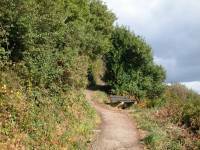 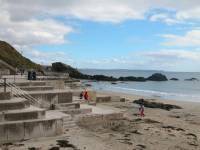 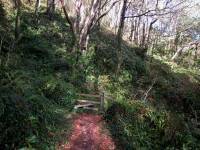 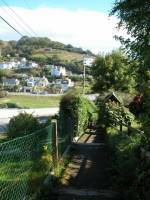 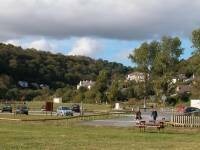 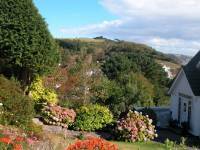 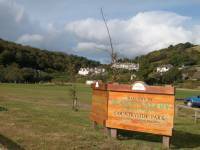 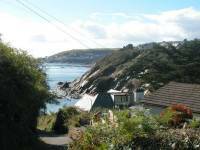 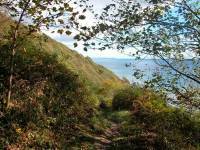 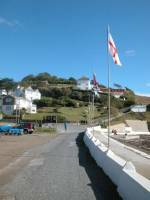 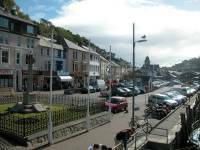 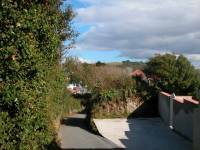 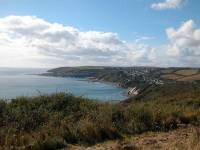 At the top there is a rewarding view over the town and across to West Looe and Hannafore. 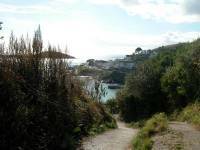 From the "landing" at the top of the steps a path follows a terrace to the east, and this is our route. 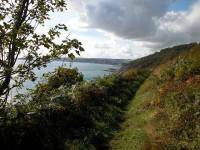 The path runs for a good half mile, through partial tree cover, giving good coastal views throughout. 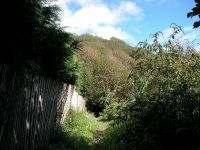 Occasionally, side paths disappear off to the left and there will be occasional views of houses. 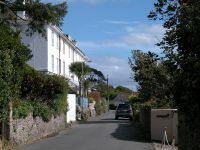 Eventually the occasional glimpses of houses become more numerous, the path widens and improves, and suddenly you emerge onto a residential road. 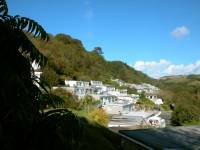 This is Plaidy Lane, East Looe's most desirable residential limb and a paradise of dream houses and cottages overlooking the sea. 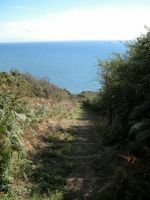 Plaidy Lane runs high above the coastline. 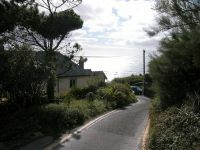 The lane is a dead end; all at once the lane turns to the left away from the coast. 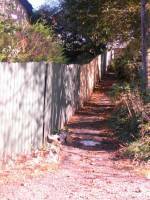 Keep a look out for the steep, narrow path that heads up to the right between residential properties. 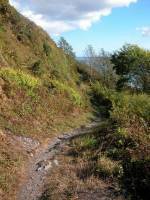 It's a short pedestrian route up behind the steep inlet of Millendreath Beach. 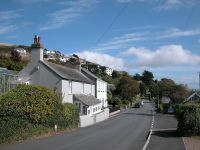 Millendreath is an isolated little community, largely a holiday village, that clusters around a beach backed by steep cliffs and runs for about 500m back along the valley inland. 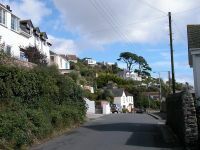 Having climbed up from Plaidy Lane you first encounter another smart residential road, and then another little path beside a house that disgorges you onto a viewpoint above Millendreath near the top of the west cliff. 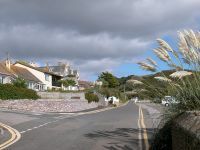 A steepish path winds purposefully down to the beach, passing a bar / restaurant that is presumably the focal point of the holiday village. 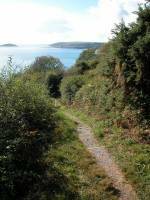 The coast path's encounter with Millendreath is short and sweet. 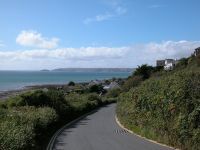 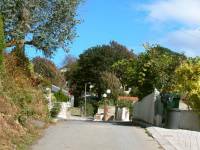 Walk along the roadway behind the beach and sea wall and follow the lane steeply up to the northeast, among yet more highly desirable houses and cottages with lush gardens. 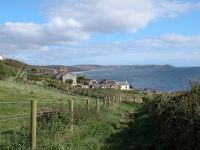 Near the top end of the village the coast path resumes to the right. 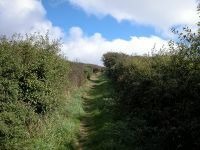 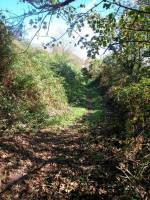 Immediately beyond Millendreath is a short stretch of path that is well hemmed in by trees. 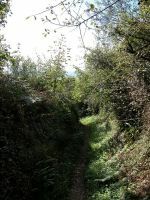 It emerges onto a motor road (second picture above), which you follow for a couple of hundred metres towards the locality of Bodigga. 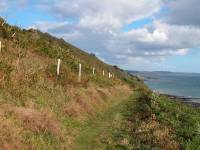 Look out for a coast path sign directing you down a path to the right. 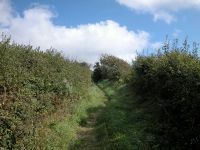 The access path comes out onto a wide swathe of open grassland, set out with a handful of picnic tables, a good place for a morning refreshment break. 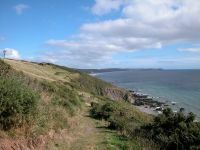 You're at Bodigga Cliffs, and the viewpoint gives a grand retrospective vista back across Millendreath, Looe and Hannafore towards Hendersick Point. 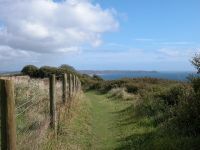 Head towards the southeast corner of the grassy pasture, where you will find the continuation of the coast path. 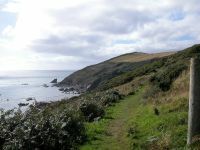 The nature of the scenery changes completely at this point for you return to the kind of terrain that characterized the Fowey - Polperro stretch of two days ago. 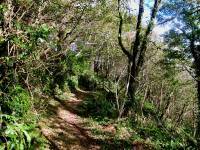 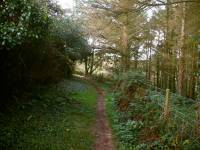 The path traverses a mile of sloping scrub and woodland, and does so by means of a good many twists and turns and ascents and descents. 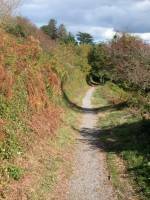 This is a lonely and tiring stretch. 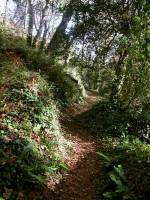 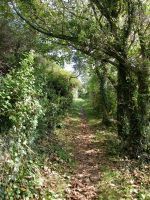 There is a long woodland section, for which the weather has to be just right - under dull skies it's gloomy, on a hot day it's stifling, but under the dappled sun of a spring or autumn day it's one of the prettiest sections of the whole coast path. 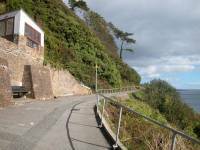 You will see a number of "danger, keep out" notices to your left - you're passing below the Looe Monkey Sanctuary, a visitor attraction well worth a look if you have time. 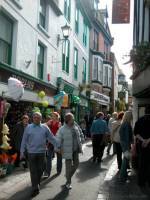 It opens from 11 to 4.30, Sundays to Thursdays, between Easter and September. 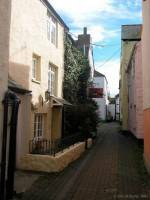 You should allow two hours for a visit. 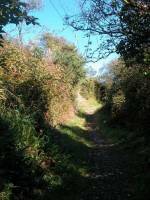 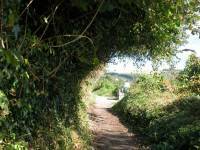 There is no access from the coast path - instead, walk along the lane from Millendreath or from Seaton. 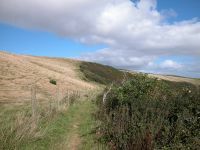 A good mile after leaving the Bodigga Cliff viewpoint the nature of the walk changes again, as you emerge from the woods onto an area of relatively open pasture. 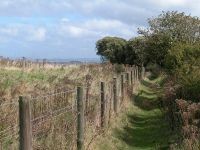 You're on National Trust territory here, and this locality is known as Struddicks. 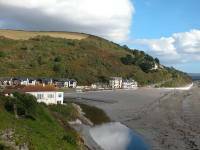 You're on an outward curve of the coastline so views ahead are restricted, but the retrospective views of Looe and Hannafore continue to delight. 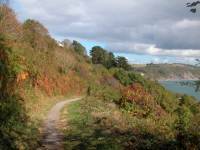 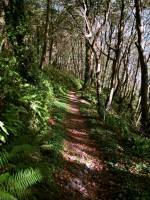 The coast path suddenly turns leftwards and plunges into woodland once more. 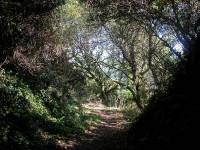 The wood is barely noticeable on the map but is actually quite dense and serves to shut out a good deal of light. 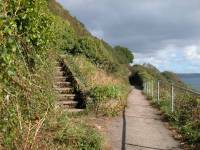 A remarkably steep flight of steps at the far end of the wood drops you - almost literally - onto the coast road into Seaton. 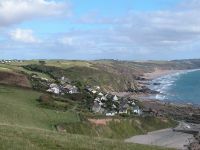 Seaton is a small but strategic locality roughly halfway between Looe and Portwrinkle. 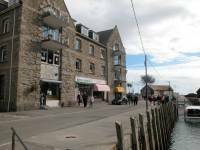 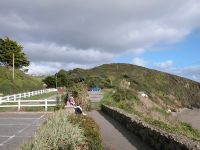 A small village, it clusters around a sandy beach and a large village green, and has the usual facilities such as a beach cafe. 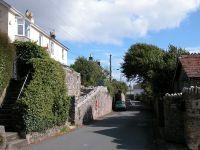 There is about 400m of road walk from the steps from the wood into Seaton, of which the latter 200m is residential. 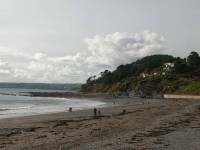 Seaton makes an obvious lunch stop and is a pleasant place to linger awhile. 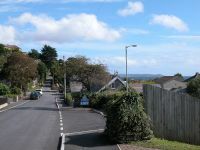 Downderry is effectively a residential extension of Seaton to the east, but it is actually rather larger. 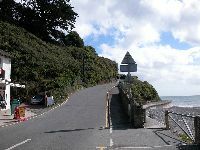 The official guidebook suggests that the sea wall east of Seaton is the preferred route, though it is a rather unscenic option and the beach itself might be preferred. 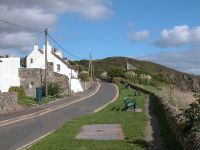 A local authority notice tells you that you should use the road through Downderry rather than the sea wall, as the latter is in bad repair. 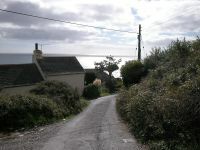 In either event, the distance either through or below Downderry is about a mile. 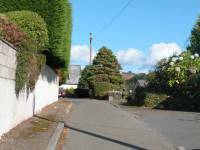 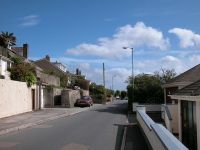 The walk through Downderry is most pleasant - the place has quite a refined air and is characterised by large and rather smart houses, many of them gleaming white. 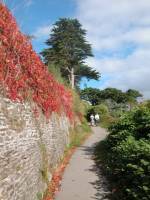 If you choose the sea wall / beach option, walking is relatively swift if rather uninteresting. 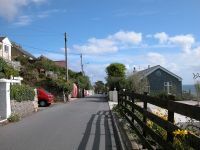 Ignoring various ramshackle constructions of steps and ladders leading off from the beach, make your way to an obvious slipway and take the road northwards into the village. 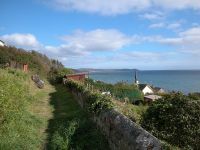 The sea wall and village routes converge towards the east end of Downderry, about 1.8km from Seaton beach. 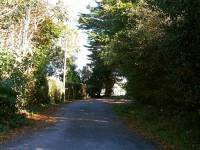 There's probably another 200m of Downderry to walk through. 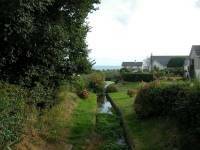 Look out for the stream and its smart environs right near the eastern edge of the village. 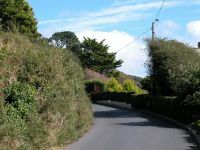 Once you're past the last houses the road runs for a further 200m through open country before veering left around a sharp bend. 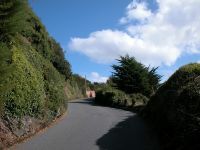 Just over half way round this bend, right beside a house, is a pathway up to Battern Cliffs. 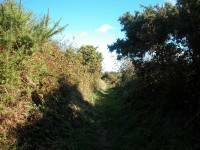 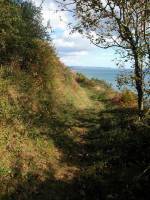 The pathway up from Downderry to Battern Cliffs is well constructed, and incorporates zigzags and flights of steps. 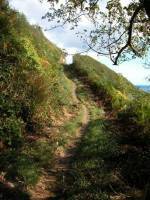 It gains height quickly and it needs to, for the cliffs mark the highest elevation of the South Cornwall Coast Path, at 462ft. 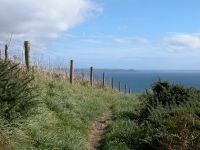 There's just over two miles to walk between here and Portwrinkle but they are long and tiring miles, and once again you are on the familiar territory of clifftop walks and scrubby slopes. 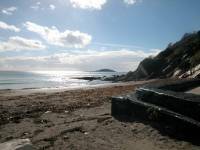 It's tiring work. 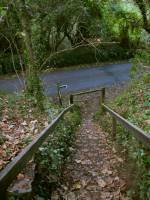 First, however, you have Battern Heights to climb. 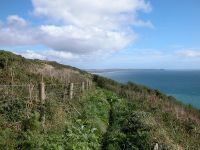 Having got to the initial stage of the clifftop the land continues to rise, but more gradually. 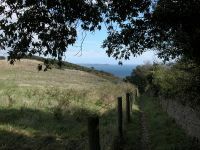 All the views are behind, and once again they encompass all the country walked today and the latter half of yesterday, back to Hendersick Point. 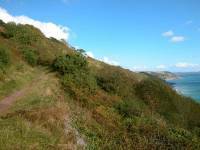 Battern Cliffs consist of a steepish face topped by a shallower slope cloaked by scrub, and you really only see this shallow slope. 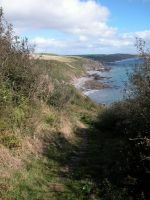 Quite suddenly you reach the highest point of the path and the view sweeps down across the Cawsand peninsula towards the Tamar estuary, with Plymouth crowding the far bank. 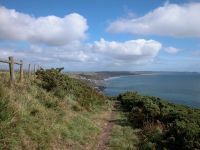 It's a dramatic moment and it brings home to you quite forcefully that your fortnight's journey along Cornwall's dramatic coast is nearly ended. 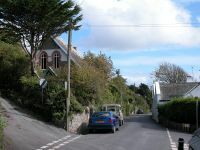 A few moments later you approach a motor road, the B3247 Seaton - Crafthole - Cawsand road. 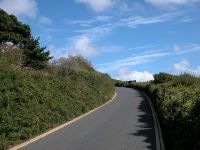 Up to very recently the bulk of the day's remaining miles were routed along this road for two reasons - there was no designated right of way for much of the distance from here to Portwrinkle, and part of the coast had suffered a landslip that had obliterated a section of the unofficial path that was gradually appearing. 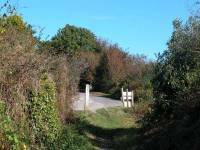 Now, fortunately, these problems have been addressed and a new right of way has been established for this last mile and a half. 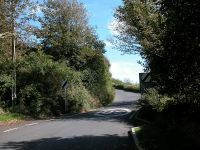 It occasionally hugs the top of the slope, at other times dropping down among the scrub to resume that all too familiar rollercoaster of descent and reascent. 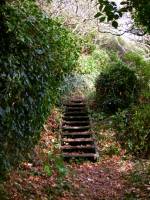 You've probably started to tire now, and a series of stiles will bring home that tiredness. 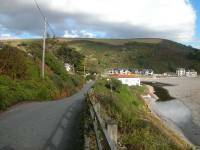 Fortunately Portwrinkle gets noticeably nearer with every step. 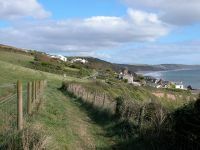 The coast path approaches Portwrinkle by means of a short path a little way up the slope, passing above a row of cottages and disgorging you towards the lower end of a steep lane. 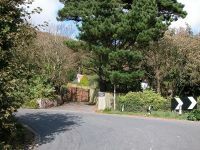 Turn right and follow the lane down into Portwrinkle itself, a small but entirely pleasant little village. 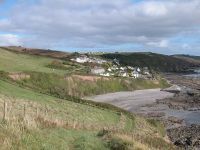 Apart from the meagre beach and the Whitsand Bay Hotel at the eastern end of the village, Portwrinkle has no facilities. 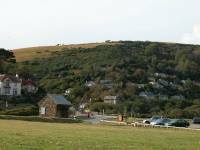 Having checked the bus times, either wait at the car park or walk up Finnygook Lane to the bus shelter at the crossroads in Crafthole (only 500m inland) for the more frequent service to Plymouth or Looe.